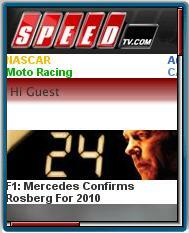 Speed is a North American cable and satellite TV channel focused on motor racing, especially NASCAR and Forumula 1. There is also coverage of Moto-GP, WRC, the American Le Mans series and auto and motorcycle racing in general along with features showcasing high performance cars and bikes, both current and vintage. The channel’s web and mobile sites are a nice surprise. A lot of cable channels run their Web sites primarily as a promotional tool for their TV presence with schedules, talent bios, teasers about upcoming shows and not much else. The mobile edition of SPEEDtv.com however, is a pure motorsports news site with race results, series standings, motor racing news, reader polls and reviews and photos of fast cars and motorcycles. It’s great content for the motor racing fan and there is a lot of it too, well over 100 in-depth news items with photos. This entry was posted in Sports by Dennis Bournique. Bookmark the permalink.